A modified version of AFT 1.66 which adds new functionality and makes changes to the dialogue menu system. Amazing Follower Tweaks: Dheuster's permissions allow for modification with credit, and permission has been given for modification and redistribution. 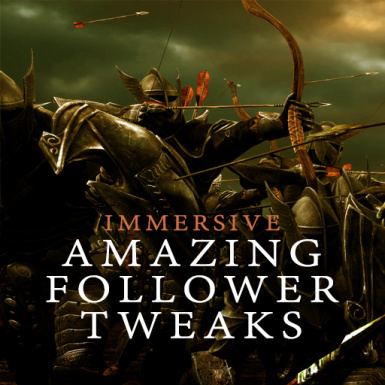 Immersive Follower Tweaks: No permissions necessary. Additional content is granted to the Public Domain. Removed some code from tweakplayermonitorscript that constantly checks for whether or not the player is in dialogue. The only purpose seems to be geared towards a follower sandbox restriction option that iAFT has ignored anyway. This fixes the problem with Karliah walking away in the wrong direction during the Trinity Restored quest (and hopefully any similar but undiscovered issues). Reordered transformation menus to avoid conditional conflicts. Added a "dismiss but hang out here" option. Reorganized abilities menu, fixed missing "home outfit" options. Removed favor dialogue from dogs. Set default carry weight to 300. Fixed missing "revert form" option for beast/vampire followers. Removed DLC patch (not necessary as the original AFT transform ability has a player-change option). DFD Patch 1.01 - Had the DLC patch accidentally uploaded instead. Fixed the broken Ignore Beast Followers MCM option as well as a few minor MCM errors. Reduced total follower count from 100 to 90, fixing a problem where the mod scripts would not start on a new game. Not sure if I made a mistake somewhere in between or there was a threshold, but it works now and 90 is nearly just as good. Redacted part of the original AFT Boethiah fix in order to prevent the quest from hanging when hard-coded essential NPCs are sacrificed. Tested with several followers and everything seems to work. Restored the Tweak Make Follower functionality in the form of Leadership (Advanced). It is a targeted spell that should work on all NPCs, making the more "safe" Leadership spell unneeded for advanced players. The fearless followers MCM option now takes effect both before and after recruiting followers. Removed DLC requirement. A patch for Dawnguard features can be downloaded from the optional files section. Added Reset AFT option in the MCM. Restored follower riding ability, added MCM option. Throw bug voice fix is now optional with an MCM toggle but will disable riding while active. Raised managed follower limit to 100 from 32. Active follower limit is still 30. Added Dawnguard dependency for werewolf change quest compatibility. Updated and separated 3DNPC patch. Increased active follower count to 30. Helmet options take immediate effect. Added wait option to MCM. Added ignore beast form option to MCM. Changed "open your backpack" to "let me see your inventory". Added transformation options to immersive dialogue menu. Werewolf followers will now change into beast form along with the player. Disabled vampirism and lycanthropy confirmation messages. Note: The Cicero dance patch and the friendly-fire spell patch from the original AFT files are verified as being fully compatible. Removed broken duplicate dialogue "fix". Duplicate dialogues were the result of More Follower Voices. Carry weight option in MCM takes immediate effect now and should stick. Restored FollowerHuntingBow from deleted state. Fixed friendly fire setting in MCM. Fixed carry weight not sticking across game sessions. Fixed carry weight not being set. Removed relationship rank requirement for Leadership. Reformatted Follower Death Chance MCM option. Fixed essential followers not being able to die. Added an option to recruit essential followers through the Leadership ability. Minor environmental AI ajustments for followers. Added some tweaks from Move It, Dammit! Adjustments to animal followers (experimental). Reverted to AmazingFollowerTweaks.esp and .bsa naming convention to avoid conflicts with patches. Added limited MCM for frequently-used options. Fixed duplicate dialogue entries for Interesting NPCs. This will replace AmazingFollowerTweaks.esp in your load order. The original is not needed. Switching from AFT 1.66 and/or updating iAFT mid-game may or may not work and is not recommended. If you do plan to switch or update mid-game, first use the AFT Reset option to dismiss your followers and follow the instructions that pop up when you use it. Be sure you give the reset function time to complete the process! Then create a clean save by deactivating the mod before making the switch. You can then attempt to make the change, provided the AFT Reset option works properly for you. If it doesn't, begin a new game. Notice: I am regrettably unable to help troubleshoot issues with custom followers at this point. "Tweak Options" is substituted with a much smaller and more immersive "Let's talk about your abilities" menu. Followers will now relax when waiting. A waiting option for the entire party will appear in the main dialogue menu when there is more than one follower. The mod is compatible with the Cicero dances and friendly-fire spell patches on the original AFT download page. Followers who have been dismissed will re-equip their best gear automatically when re-hired. If either Frostfall or Sabre Gear Backpack are installed, new followers will be given a backpack. Most messagebox pop-ups have been disabled. A new power, called "Leadership", has been added. Using it will toggle the ability to recruit non-essential characters as followers through the standard dialogue menu. By default, essential and certain other NPCs cannot be recruited as a "safe" option. Another targeted spell, called "Leadership (Advanced)" will work on any NPC. 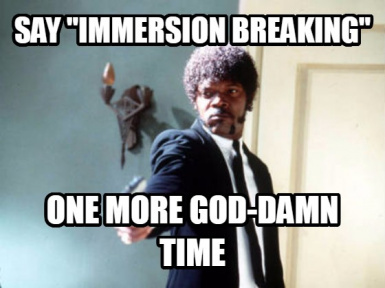 Default options have been changed throughout the mod to recommended settings for immersion. SkyUI users will have access to a limited MCM. The active follower limit has been increased to 30. The number of total slots available is now 90. Werewolf and werebear followers will now change into beast form along with the player (optional DLC patch required). Optional throw-voice bugfix in MCM: Followers are no longer added to the player faction in order to avoid the "Hey!" shout voice issue that arises when using USLEEP and certain custom NPCs. AFT's horse riding feature will be disabled if the fix is active. I suggest a mod like Convenient Horses instead. Problems with the Boethiah questline have been fixed. Unless specifically mentioned in the changelog, no further updates should require the start of a new game, but it may be good practice to use the AFT Reset option after updating. If all else fails, test by starting a new game with all other mods disabled and your scripts folder temporarily renamed. Dynamic Follower Dialogue: There was a compatible version available from the author, but the mod has since been hidden. In case you haven't got the latest update to DFD for iAFT, I've added a compatibility patch to the optional downloads that should work. Immersive Horses: Download Simple Follower Mount and it will allow the Horse Menu in Immersive Horses to assign ownership to your team or your follower, and then AFT followers can ride the horses. MFVM: You will get duplicate dialogue options for followers with the new voice types. 3DNPC (Interesting NPCs): You may need to use the Creation Kit or TES5Edit to remove the hard-coded "essential" status of some NPCs before they can be chance-killed in iAFT. Follower Trap Safety will be redundant. AFT has a built-in follower trap trigger setting. Better Stealth AI is compatible and iAFT has a script that checks for it and puts new followers into the correct faction. Traps Make Noise is compatible with everything except bear traps and will override AFT's follower safety feature on those. You can use it with Follower Trap Safety and place both below AFT. If you want to use the 3DNPC patch or the DLC patch but don't want extra .esp files in your load order, open them up in TESVEdit and copy their contents as overrides into AmazingFollowerTweaks.esp. You can then delete the patch .esp and .bsa files (but keep the loose files included in the downloads). Dheuster: For Amazing Follower Tweaks, which comprises the majority of this mod's assets. Please endorse the original!